Want to know my biggest secret for getting out and about with my 2-year-old and a 3-month-old as much as we do? Drum rolllllllll, okay maybe not a drum roll because we are now in 2018 and most likely no one says that anymore, but it's our UPPAbaby VISTA stroller! This double stroller literally makes my day to day easier. I use it on playdates to carry all of our stuff, the zoo, going to the grocery store, getting in and out of the gym, power walking with my friends through fancy neighborhoods. You name it, and I'll be there with my stroller in hand. It's one of the easiest strollers I have ever used. I was a nanny forever and have used my fair share of strollers and our VISTA is by far the easiest to get in and out of my car a thousand times with its one step fold system. I can get both of my kiddos in the car and the stroller put away faster than a lot of my friends with only 1 child or a bulkier stroller. I also love that it can grow with your family, we currently use the Bassinet and car seat as the second attachments with Pearl, but she will be able to go in the RumbleSeat soon and I'm looking forward to having that option thrown into the mix. I will say, I do love using the bassinet and we mostly use that when we go on family walks. It keeps Pearl so cozy and also hidden away from any wind. 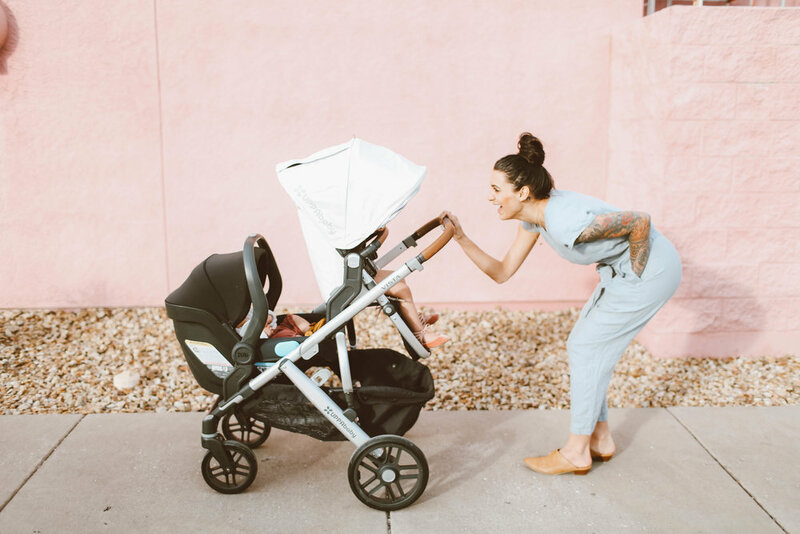 Their bassinet also passes overnight sleep standards and you can order the Bassinet Stand to go with it and if you are on a walk through the neighborhood and your sweet babe falls asleep, it makes for an easy transition. There are so many different options and ways you can adjust the seats and I can pretty much fit enough snacks and toys for a small army in the storage basket. You can even add the ride along board and push all three kids together on it (hint hint Austin). I have my first solo trip with both girls coming up and I'm way less stressed knowing I'll have the VISTA with me to carry all my babies and bags! The storage basket can hold up to 30 pounds so I'm looking forward to lugging it through the airport with all of our bags.